The Doran Model 4300 is the solution to lowering your scale maintenance costs and downtime! For almost 30 years, Doran Scales has been recognized as the industry leader in providing the most durable and accurate, washdown safe Stainless Steel Scales. Providing legions of satisfied users with the lowest total cost of ownership. 1000% Overload Protection - With the unique “Quad Spring©” base design, Doran Scales has virtually eliminated the most common load cell damage caused by shock and overload damage. Protected to up to 10 times capacity, the 4300 Checkweigh Scale sets the new industry standard - A Doran Exclusive! Indestructible “Guardian” Touch Panel - Reduced down time and lower maintenance costs even in repeated harsh washdown environments. Four times thicker than the competition, this super rugged touch panel resists moisture and puncture damage better than any other scale. Easy Operation - Simple to use with minimal operator training. Set Over/Under tolerances right from the front panel using the Up/Down arrow buttons. 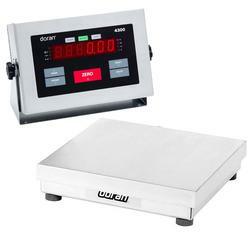 Checkweigh to zero or actual weight with 3 or 5 zone checkweighing operations. Optional Interfaces: USB 2.0, RS-485, 4-20mA, Fiber Optic, Washdown Ethernet (Wired or Wireless - 802.11b), User definable data output, all Field Installable Options. Dimension setup and optional Excelerator data collection Windows software. 8" x 8" 10" x 10" 12" x 12" 15" x 15"